I’ve recently found a fun way to spend a little mindless down-time that also gives you a chance at winning some fun prizes as well! ShopYourWay’s new Win Your Way portal is an app that is part of the ShopYourWay social shopping platform. There is a constant stream of new and unique sweepstakes with prizes including: ShopYourWay Rewards points, trips to locations around the country, jewelry, clothing, appliances, tools, and gadgets. I just spent a little too much time on the site entering for several different giveaways… 10,000 points (which converts to shopping money at Sears and KMart), a TV, a diamond ring and a trip to LA. It’s so much fun though and I get excited thinking I might be receiving a winning notification email in the next few days! Clicking on the giveaway you are interested causes the screen to open a bit with directions on how to enter. Everything you need to know is right there, including a help page and an update on your progress if you get distracted and have to come back to finish later. 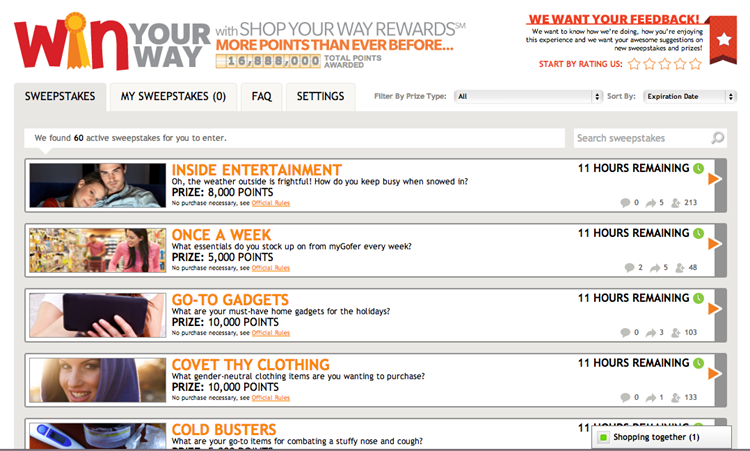 Many of the giveaways have very low entries like this one I entered for 10,000 points! All I had to do to enter was find 10 gender neutral items I liked, click “want it” and I was done! I was entering another contest and got a little caught up in the appliance department for points… I found a fridge, double range, over the range microwave and external ice maker to complete my dream kitchen makeover. If you’re already a ShopYourWay Rewards member, it’s a no brainer. If you’re not, it only takes a few minutes to sign up and you’re ready to enter the night away! It’s easy enough I do it while watching television with the family at night! Sweepstakes rules: “No purchase necessary. See http://bit.ly/RdfB8K for details. Wow this sounds neat! I love entering sweepstakes!